​I am pleased to tell you that we will be using a website called IXL in our classroom this year. IXL is a comprehensive learning program offering unlimited math practice problems in thousands of skills—all of which are aligned to Virginia SOL. One of the best things about IXL is that your child can access it from home, so you have a chance to see your child's progress! 3.Click the top of the page and navigate to 2nd grade. Select a specific skill to practice from the list of skills. You can place your mouse over any skill to see a sample question and click on the link to begin. I will put skills to practice on my newsletter for the skills we are working on for the week! 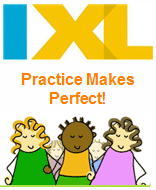 In addition to making practice exciting, IXL is designed to help your child learn at his or her own pace. The program is adaptive and will adjust based on your child's demonstrated understanding of the material. All of your child's results will be saved, so you can monitor his or her progress anytime by clicking on the Analytics tab at the top of the page. For on-the-go practice, you can download IXL’s free tablet apps for iPad, Android, or Kindle and sign in with your child’s username and password. I hope you'll encourage your son or daughter to use IXL regularly. Here's to a year of working together to make learning fun for your child!